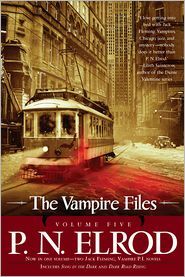 Includes "A Song in the Dark" and "Dark Road Rising"
My name is Jack Fleming, nightclub owner, P.I.--and vampire. Usually, that's a combination that keeps me safe. But when a New York lowlife muscled in on Chicago territory, I survived his attempt to kill me by the skin of my fangs. It brought out the vampire in me--and if I don't get my blood hunger back under control and do some detecting, not only might my girlfriend Bobbi take the fall for a murder she didn't commit, but the newly risen vampire I've been charged with babysitting--a nutjob mobster named "Whitey" Kroun--may do more damage than the syndicate torpedoes who are out to get him.